Buying your first horse - are you ready? At one time or another, most children will raise the subject of owning a horse or pony. For some this desire for a horse will be no more than a fleeting daydream (much to the relief of the parents!) but for others, the want for a horse will last forever. While all pets require commitment and financing, the demands of horses are unrivalled when it comes to caring for companion animals. For children and young adults, providing for a horse will also require the enthusiasm, dedication and funding of others, as, no matter how much they love their horse, they will not be able to meet all its care needs alone. Before you consider purchasing your first horse or pony, honestly assess your present circumstances and your ability to take on the responsibility of one of these incredible (but demanding) animals. Owning a horse shouldn't be a burden and fitting one into your life should work comfortably, as opposed to bringing anxiety and financial difficulty. Domestic dogs and cats can easily be placed with friends or relatives if your circumstances change or you go away on holiday, but horses are an altogether different ball game. Organising help in your absence is often costly and requires a lot of communication and trust. Also, because horses are used in a variety of ways, from agriculture to showing and everyday leisure riding, injuries and health complaints are more of a likelihood and a problem. Caring for a horse involves your attentions numerous times daily, 7 days a week, 365 days a year. There is no concession for bad weather, seasonal illness, or when you have other arrangements and priorities. Your horse will depend on you constantly and this is something to bear in mind when looking to become a first-time owner. It is impossible to accurately predict the annual costs of owning a single horse. The horse itself, as well as the initial outlay of stabling, tack, feed and accessories are known expenses that can be worked on a budget. For all your grooming essentials, including a hard-wearing brush, comb, hoof pick and sweat scraper, our Cottage Craft grooming kit is a must-have for new horse owners who are looking for a complete, convenient and affordable product to get started with. Their candy stripe headcollar is also a great item made from high quality webbing with fleece padding, designed to fit the size and shape of the face comfortably. Available in a range of colours and sizes, there is a suitable headcollar for every horse. Cottage Craft's range also covers lead ropes made from colourful twisted cotton, which will really get you noticed. However, other aspects of care can’t be gauged in advance but still need to be accounted for. Health care, for example, is a factor that is subject to change. Vaccinations are usually given once a year and the costs of dental care, as well as shoeing, are also there during the year. If you manage to get through 12 months with these expenses alone, you have done well! It is likely that somewhere along the way your horse will need veterinary assistance, which, if you’re particularly unlucky, can cost a small fortune. Therefore, having the means to fund emergency care is essential. 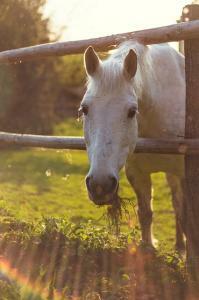 Feed is a regular cost that will account for most of what you spend on your horse. Hay, salt licks and supplements are also necessary for a complete diet. Combined, the cost of these can add up and you are looking at spending a tidy sum each week, especially if your horse is sizable and has a large workload. It is important to feed your horse a high quality diet, as, whilst it will cost more initially, it should mean your horse consumes less food and saves you money in the long-run. In terms of grazing your equine, it is estimated that 2 acres of land provides a suitable pasture to sustain a single horse. If you have this space at home – great! If, however, you don’t have the land to graze your horse, placing it in livery is a good option. Whether you choose full or part-livery is up to you and is dependent on your budget. Livery can work well for first-time horse owners as it gives flexibility and is a great place to meet other equestrians and learn more about horse care. Owning a horse is not only expensive, but it is time consuming. Whether it’s exercising your horse, grooming it (including tending to its hooves), administering health care or preparing its daily feeds, the process of looking after a horse is demanding of your time. Horses are social creatures and providing human interaction is a vital aspect of everyday care. This means spending time with your animal and ensuring its basic needs are met, as well as going the extra mile to support its continued health and happiness. Going away is not a straight-forward decision for the horse owner, either. Much preparation is needed to take even a short break and livery isn't for everyone (or every horse). Before purchasing a horse, find out whether family or friends would be willing to accept it into their care while you are away and have a back-up plan in place in case this falls through. Horses and ponies are susceptible to various conditions ranging in severity, and sometimes identifying them early on can be the difference between life and death. Would you be able to recognise an emergency situation from a minor complaint and know how to respond to it? This is perhaps the single most important piece of knowledge you can have. Other details such as good horsemanship, how to handle a horse, how to groom a horse etc are also relevant for the first-time owner. Reading up on various aspects of horse care will be beneficial to both you and your new horse, so don’t go into purchasing one without the crucial information behind you. Knowledge will come through experience, but equipping yourself with the basics at the very beginning will safeguard you and your horse from any avoidable harm. Once you have considered all areas of horse ownership and decided it's for you, you can begin the exciting process of choosing a mount! Be mindful not to choose the first horse you go to look at and allowing your heart to rule your head. Unless you are very experienced, re-training a horse to fulfil your favoured discipline is definitely a no-go, so make sure you purchase a horse that best suits your needs as a first-time owner from the off, without the rigmarole of finding someone willing to re-train it. Also, make certain never to ride a horse that you have not seen ridden by someone else. Thanks for the great article Hannah, hopefully it will help us to think carefully before buying a horse. One thing that I would add is that we hear a lot about dogs being for life, but we don't yet seem to have grasped the same idea regarding horses. A horse finds it as stressful as a dog to be re-homed, so it seems strange that we think it's OK to pass them from home to home. Let's think again and decide to say that horses are also for life! Thank you both for good common sense comments and I totally agree that horses/ponies are for life. I have been owning horses for over 30 years and NEVER have I sold on or loaned out any of my animals. it's not the cheap option, but if you are buying a horse - newsflash - nothing about horse ownership is cheap. The rewards and pleasure, however..... endless!! These days I see many young or even not so young over horsing themselves, obviously wanting to be seen on a big imposing 16.2 TB or ISH which they simply cannot handle, when in fact a 14.2 to 15hh cob type would be much more fun and less unnerving. They can cost a bit more than an ex racer but there is a reason for that ! Don't forget to include your farrier's cost. You may need to allow up to Â£80 each time he/she visits. Hopefully you see your farrier more often than your vet. Take soundings to find which farrier is highly rated locally and book ahead to keep your position on their books. Excellent article. - Owning a horse is a very expensive and time consuming hobby and i would suggest getting one on loan first as we did for our daughter to make sure she was committed to caring and for the welfare of owning a horse. We then bought her a 7yr old whom we had for 21 years and sadly lost him last month at the age of 28 years.